Forward-thinking institutions like Spaulding Rehabilitation Hospital, which opened its doors April 2013, are using lessons learned from hospitals in other cities to prepare for natural disasters. When Hurricane Sandy hit New York City in October 2012 and the generator power at NYU’s Langone Medical Center failed, 215 patients had to be evacuated using stairwells. The process took 15 hours. Babies on ventilators and elderly folks in wheelchairs were highly dependent on the brave and competent hospital and rescue personnel. In some New Orleans hospitals hit by Hurricane Katrina in August 2005, patients were trapped for days when electricity failed and windows remained locked shut—some patients resorted to breaking windows with furniture from the sweltering buildings. The designers of Spaulding Rehabilitation Hospital in Boston, Massachusetts are doing everything they can to prevent similar tragedies and challenges when the next storm hits. Located on the Boston Harbor, this LEED Gold center is designed to withstand storms and floods, which are expected to increase in frequency and intensity with climate change. 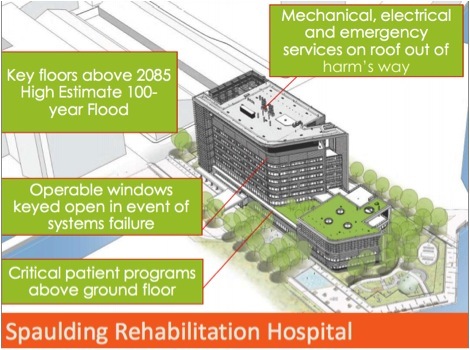 All patients are housed above the ground floor, and important floors like emergency services are located above the predicted 2085 100-year floodplain, accounting for expected sea level rise. Critical electrical and mechanical facilities are on the roof rather than in the basement. All these innovations enhance the likelihood that patients and staff will be able to stay in the building in the event of a natural disaster. But, on the chance that people do have to evacuate, the windows open automatically if any major systems fail. 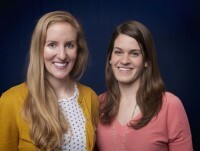 Good stuff Kirsten and Allie! It’s great to hear about all the real-life examples of climate adaptation happening around the country. Good to see SNRE alum Brian Swett featured here too. Keep up the great work and safe travels!